Sydney's Fashion Diary: Weekend Fun: My first macaron experience! Weekend Fun: My first macaron experience! Hope you all are enjoying your weekend! This morning, my husband and I took a little trip downtown to check out a French bakery. I've heard so much about macarons (French cookies) but never had a chance to try them just yet. At one time, I was considered ordering them online but shipping was ridiculous. 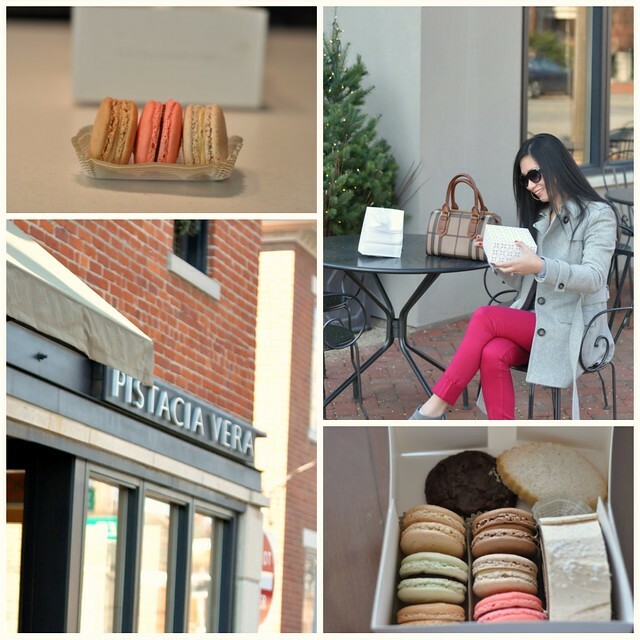 Thanks to Olyvia for letting me know about Pistacia Vera. I had no idea there is a local bakery that has macarons. I tried one of each flavor. They were good but weren't anything special to me. I am sure there are better macarons elsewhere. However, I am glad that I finally know what a macaron tastes like. I am sure we'll come back from time to time. How was your first macaron experience? Which flavor would you recommend? Yum I love macarons! I typically get pistachio or hazelnut flavors. You have to try Laduree when you are in a city that has one! And I'm adoring your pairing of the hot pink skinnies with grey. Definitely a fun way to shake up winter-wear. So jealous Sydney! I would so love to try those but haven't found any local bakery that makes them....(I am glad to hear you say they weren't terribly special) Lol Btw, your hair is getting so long, it's beautiful!! Yay! I was hoping to see this post, haha! I feel the same way about my first macaron experience. Nothing blew me away. They were just "good" So far, it seems like the nutty or caramel flavors are usually better than the pretty colorful ones for some reason. BTW, you styled those bright jeans perfectly! Macarons are sooo good! My sister makes them for as a small side business. But flavors to try are if you like citris - lemon and there is green tea and some really weird flavors too like watermelon, peanut butter? This week was my first time trying macarons as well! I am in Paris visiting a friend and on the first day we tried two different "brands". One was Laduree....I loved the chocolate there. Then we went to The Drugstore and tried the Peter Hermes (I think that was the name) and the creme brûlée was my favorite. I just tried them for the first time last week from our local bakery and I wasn't totally impressed either. They were yummy though and of course the chocolate and raspberry were my favorite. I love french macaroons! They're my favorite dessert next to cannolis. My fav. flavors are almond and lemon. I LOVE macarons! OMG I don't even know what flavors I like because I've had them at parties and it was part of the Tory Burch gift bag I received when attending their fashion show. They're all good and calorie free right??? lol! aren't they SOOO good!?! i love macarons! i want to try every flavor in the world!!! I saw Olyvia's post too and yelped a macaron place myself :) Mine were mushy but the flavor had potential. Would probably be a lot better at a real French bakery. I love your pink pants with the gray booties! Hope you had a great weekend! Yummm macarons!!! I love them :) Super delicious! They will tell you immediately a bad one from a good one. The best made ones were from de Neuville (in Hong Kong, not the Paris location) or Pierre Herme in Paris, but their flavours were whack. Oh and just to prove I know my stuff.. check out my posts.